As libertarians, we reject the initiation of force and oppression against any person, regardless of gender, race, religion, sexual orientation, etc.. We support complete equality of rights for all persons (with the understanding that this means we cannot guarantee equality of outcomes). On the face of things, it seems libertarians should absolutely support a movement intended to secure equal rights for women. It is an unequivocally positive development that women now may rise to the top of the worlds of business and politics. It is wonderful that a woman may now choose career over the traditional role of family caretaker with no stigma. It is less than wonderful, however, that the entry of women in the workforce has allowed states to raise taxes to the point where women not only have the option to work, but now must do so out of financial necessity. Women in the middle class are now generally denied the choice to raise children full time (it is also denied to men). The State has successfully used feminism as a tool to take options away from its serfs -- us. The feminist movements of the past century have had other problematic effects, including skyrocketing divorce rates, the dissolution of the nuclear family and coincident increase in juvenile criminality, and increasingly unfair treatment of men. Modern "first world" cultures that have adopted feminist ideals now generally have birth rates lower than necessary to replace themselves: as its host cultures slowly die off, feminism may eventually become a casualty of itself. On top of this, there is evidence that feminist movements have wittingly and otherwise provided cover for a theft of power away from both women and men by the world's elite ruling class. It is an open secret that many of the past century's most influential feminists worked on behalf of Communist organizations (themselves often funded by major banks). The astrological charts of some of these "Red Feminists" provide some startling insight. We will review a few here. Betty Friedan, author of The Feminine Mystique and co-founder of the National Organization for Women, did not want it known that she was active in Communist circles. This is absolutely the chart of a person susceptible to authoritarian ideology, with Pallas conjunct the South Node and ruled by Mars which is opposite Jupiter. There are no detectable libertarian factors. Suggesting left-wing economics is the Sun in the Second House opposite Neptune, which is novile Saturn, co-ruler of the Second House. Suggesting cultural leftism is the Moon trine the South Node. This is a textbook-case left-wing authoritarian chart. 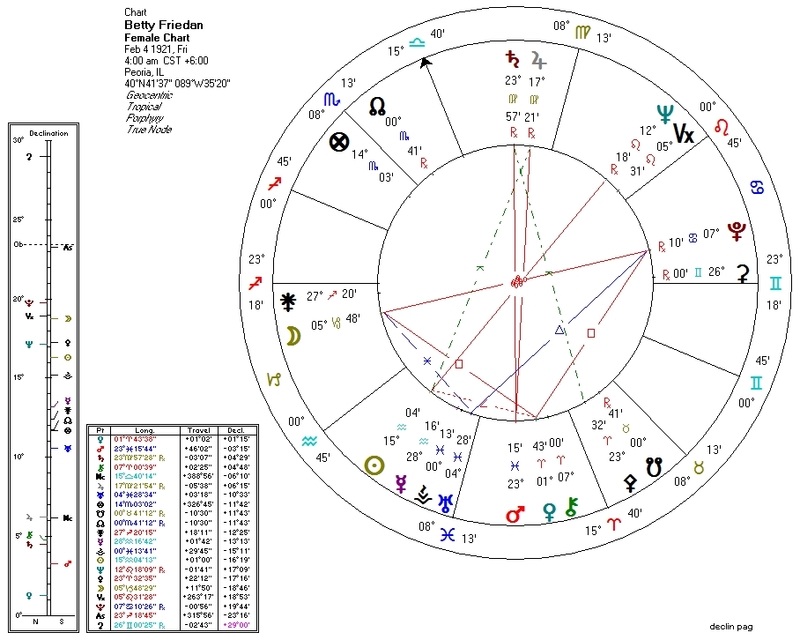 Intriguing and troubling on top of this is the Moon opposite Pluto in Cancer, and Pluto square Venus: what does this say about Friedan's perception of woman? Susan B Anthony needs no introduction, but most accounts overlook that she was a Communist. Murray Rothbard writes that the women's suffrage movement was largely intended to enable Progressives to outvote Catholics (whose women were largely apolitical). 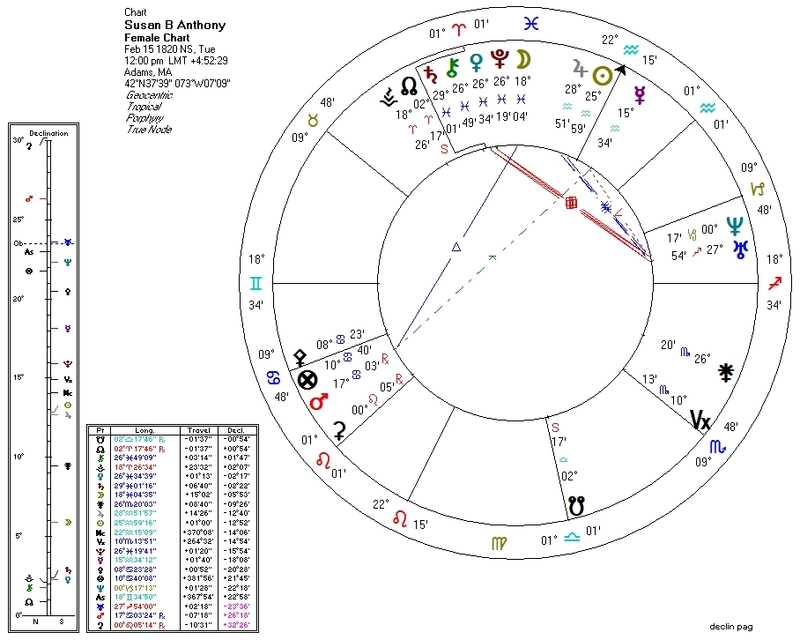 We have no time of birth, but it is very likely that the Moon, ruler of Pallas, is conjunct Pluto, making for a solidly authoritarian-type chart. Leftist economics appear as Venus square Neptune, perhaps partially offset by Venus widely conjunct the North Node. As for culture, the Moon is co-ruled by Neptune which is sextile the Moon's other co-ruler Jupiter: leftist as well. Communism is no surprise, given this chart. Anthony also shares with Friedan a (very probable) Moon-Pluto hard aspect and adds to it a very tight Venus-Pluto conjunction. As with Friedan, this is both fascinating and disturbing. 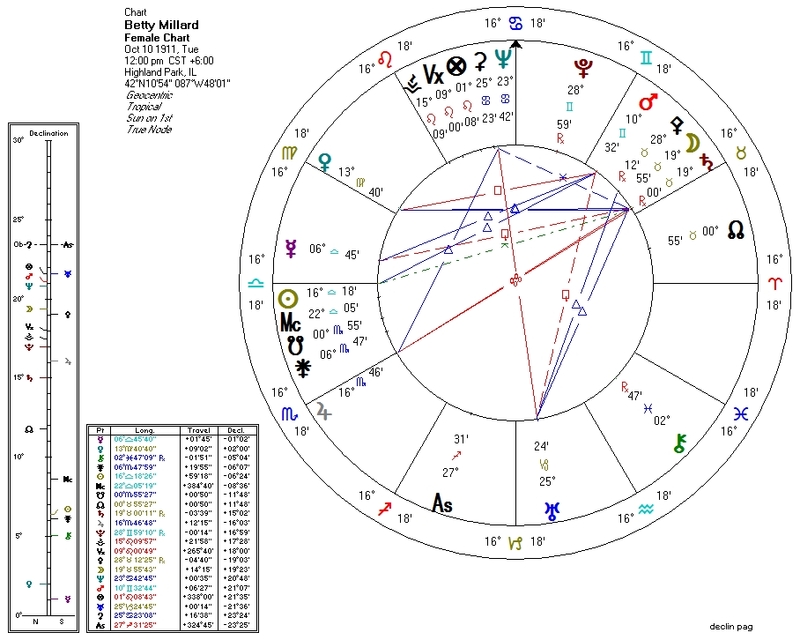 Betty Millard was openly Communist, but her chart is slightly less clear about it. Her peregrine Pluto is widely quintile Venus (ruler of Pallas) and semisextile Pallas herself, hinting at authoritarian tendencies. Venus, which rules the Moon, is septile Neptune, suggesting left-wing attitudes both on economics and culture. The aforementioned Pluto-Venus (ruler of the Moon) quintile puts also gives her more things in common with Friedan and Anthony above. Eleanor Flexner, women's studies pioneer, hid her Communist affiliation until later in life. The Pallas placement is not surprising: Pallas in Scorpio, trine Pluto which is square Pallas' co-ruler Mars. Pallas is conjunct Mercury, a strong libertarian factor which in this case is probably not strong enough to overcome Pluto. That the North Node is conjunct Pluto and also trine Pallas may or may not also temper the strong authoritarian pattern. Left-wing economics: Venus novile Neptune. Without a time of birth, we cannot tell about the lunar indications for cultural politics. Like her feminist comrades above, she also has a Venus-Pluto aspect (a sextile) and probably a Moon-Pluto quincunx as well. Eve Merriam, writer, is our last example. She has Pallas semisquare Jupiter, suggesting openness to authoritarianism. 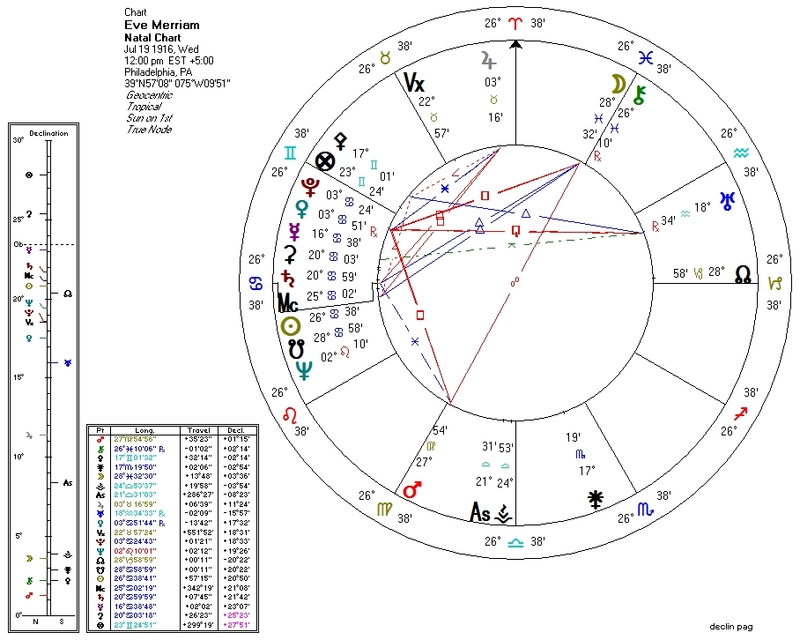 Venus is ruled by the Moon which will be trine the South Node regardless of birth time: this puts her very probably on the Left for both economics and culture. Communist affiliation is, again, no surprise. As in the four cases above, Pluto is involved with both Venus and the Moon, by conjunction and trine respectively. Obviously, by no means are all feminists Communist or even authoritarian (we may discuss CIA-operative Gloria Steinem in the future). Nevertheless, that most anti-human and freedom-killing of all political philosophies figures prominently in the history of the feminist movement. For this reason alone, it makes sense to assess the various facets of feminism individually and accept or reject them based on their merits, rather than accepting the entire package wholesale. The astrology of these five very important feminist pioneers also raises important questions. Given these clearly authoritarian charts, can we be certain that the movement these women helped create is about women's "liberation" at all? Each of these five women has her internal feminine archetypes (Moon and Venus) subject to the dissolving influence of Neptune and/or the South Node. Each, in addition, also has Pluto, astrological lord of Death, in aspect to these feminine archetypes. 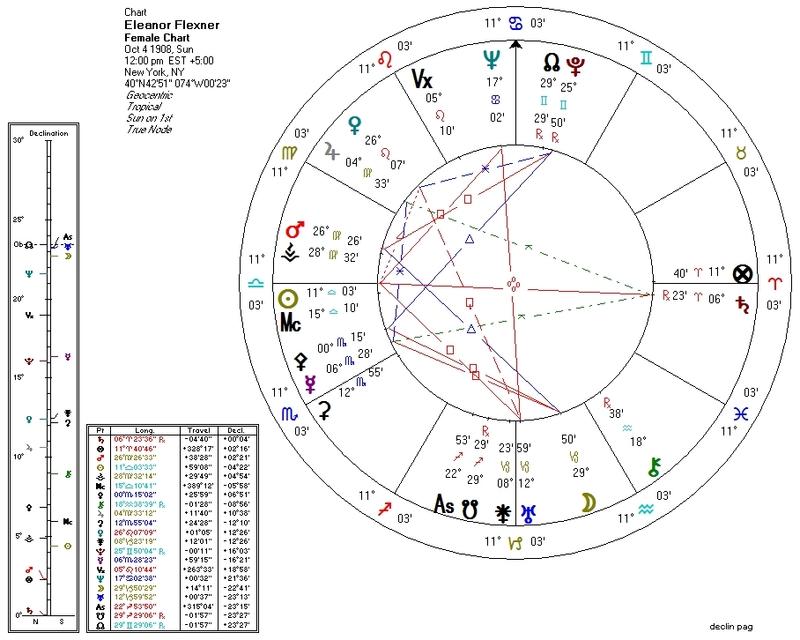 These charts are reminiscent of the chart for Islam, but with deadly Pluto standing in for combative Mars and disruptive Uranus. What does the astrology of these founding feminists say about the relationship of feminism to the archetypal female?